The trees are still bare, colorful birds are returning, and the sun is making its way out of the iron clouds. It’s March. If you live in a warmer climate, then your experience is probably a little different than mine. Nevertheless, everything speaks of change. Something is about to unfold. I dream of spring. The time when everything that has life is renewed, nature starts to sing a song of new beginning, and the smell of trees in blossom fills the air. I’ve always loved spring. Ever since I was a little girl, spring has fascinated me. Yes, my heart was younger and more naïve then; but I’ve always loved the feeling spring brought into my soul. It brought the hope of something new, something good. Today, I find myself looking at life through the same pair of innocent eyes. I can see God’s hand preparing nature for spring. God is also renewing my heart. He is bringing life, color, and warmth in the deepest corners of my being. Corners long forgotten that have been waiting for His loving embrace. Look around you, nature is waiting on the God of life to make everything new again. I think every season has a unique and deep significance. God made seasons for a purpose; each one tells us a different story. Spring is a time of new life, new beginning, and a new chance. A time of hope. I can’t wait to watch God dress the trees in beautiful greens and warm pinks. 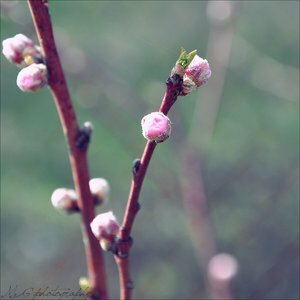 Blossoming is on its way! I can already hear birds singing! I can feel the heart of God dancing with joy as He prepares to paint our universe with color and life. We have such a beautiful, creative, and wonderful God! A God that is so often misunderstood and unnoticed. A God of life and love. A good and merciful God! None of us deserve His grace, yet in His faithfulness He still renews our universe every year. Please be aware of His love for you as we step into spring! Nature in spring speaks of a God that wants to renew your life! God wants to bring fresh hope inside your heart. Let’s not miss the beauty of it all as it unfolds right before our eyes. Let God awaken your heart to the wonder of who He is. He is a God worthy of glory and admiration!!! Just trust Him, He will bring spring into your heart as well. Don’t miss your chance for change! Have faith in God’s power to give you a new life. Let Him take your breath away. He loves to do that! An open heart is all it takes. Let God renew you! ← New year, old you?